A spectacle of exotic colour in even the smallest of gardens. Grow to just 4ft tall, totally winter hardy and guaranteed for life! It’s incredible but true… these compact beauties really will produce a tower of bright, star-shaped blooms continuously for 6 months – every year! The BOULEVARD (R) series of patio clematis has been bred specifically for a compact growing habit and a precocious flowering nature - so you can create a massive colour impact from a very limited space. Perfect for growing in small spaces, in pots and containers, so are ideal for modern gardens where space may be limited. The plants will never get out of hand and reach a mature height of around 1-1.25m (3-4ft) these splendid clematis flower from the leaf axils and the ends of the stems, resulting in blooms right from the ground. Bred and developed by world-renowned specialist Raymond Evison, Boulevard clematis are robust, hardy and easy to grow with vigorous re-growth every spring. Pruning is simple - just cut back by a third each year as growth begins again. Each supplied on a cane support, ready to plant out. 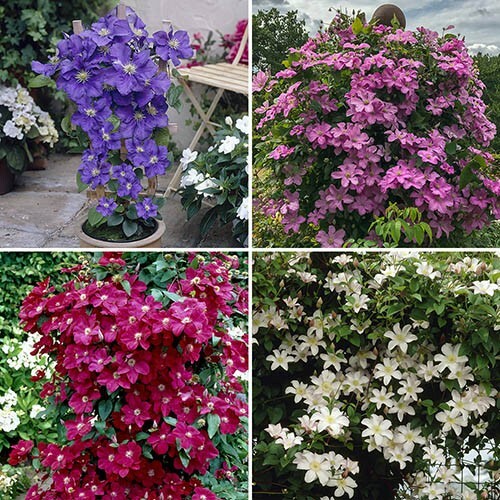 These unique clematis are simply fantastic value for money – order yours today! You'll get one each of the four colours shown. Supplied as established plants on a 60cm trellis. You will receive one each of blue, pink, white and red.